Smoking Skeleton Cauldron Fogger. Add tap water to this plastic cauldron to create eerie fog mist! 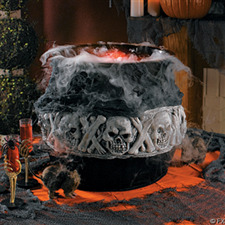 Use it indoors on or beneath a buffet table for instant Halloween party ambiance! Skull and crossbones encircle this eerie machine. 16" X 16". UL listed. For indoor use only. Instructions included.